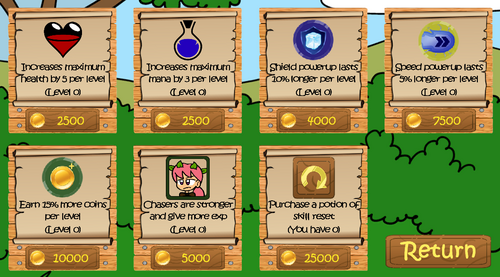 Today I'm working on the Shop page of the game. Most of the images are still placeholder pictures to help me arranging the format. All upgrades have no hard cap, but their cost increases for every level purchased, with one exception being the reset token having fixed cost. I would appreciate comments and inputs on my plan.